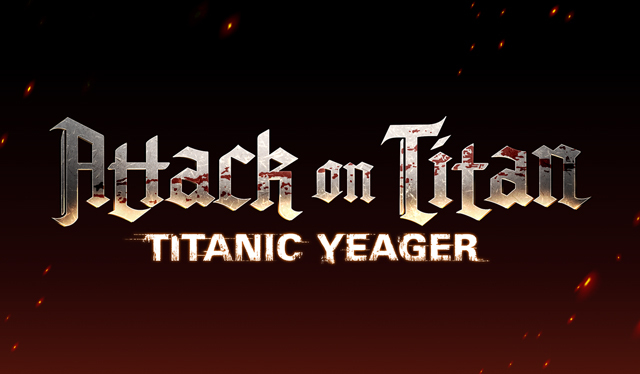 Titanic Yeager is a collaboration event with the Attack on Titan media franchise. This event is split into two parts. The second part will be available at 5 p.m., Dec 14, 2017 (JST). 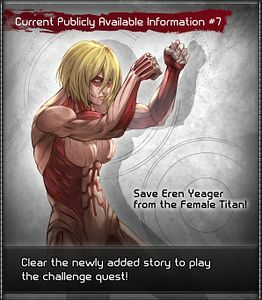 This event contains major spoilers from the Attack on Titan series. The Event Opening starts from episode 18 of the first season of the Attack on Titan anime and around chapter 22-24 of the manga. If you do not want to see any spoilers it is recommended to skip the cutscenes. 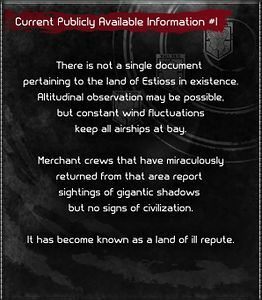 Remember that you can watch the cutscenes in your journal at a later date. all I did was get my soldiers killed! what those things really are! 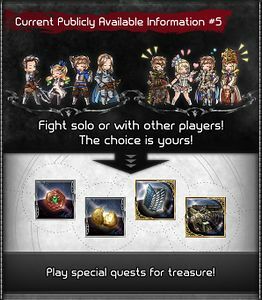 Purchase all three Premium Draw Tickets from the event shop. 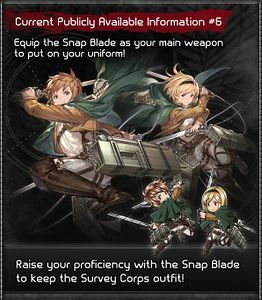 This event's raid battles provide a very large amount of proficiency points for Snap Blade if you are trying to unlock the Survey Corps outfit as fast as possible. 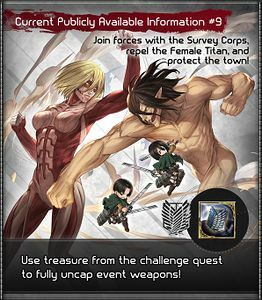 Survey Corp Insignias can be obtained from the Challenge Battle if Nightmare battles are too difficult. 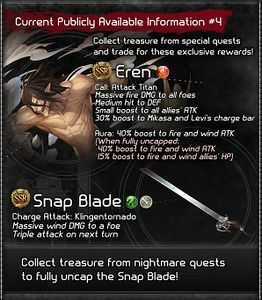 Snap Blade is a Wind EXAlso called "Unknown" or "UNK" weapon, and also a good main hand choice. Players that use Sabre specialty classes, such as the Fighter line; Knight line; or Sword Master, will want to keep one as a main hand, whereas other players should consider it if they don't have a True Conviction Flashspear. 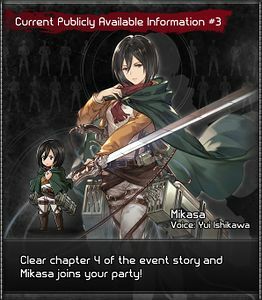 Mikasa joins you after clearing Chapter 4. 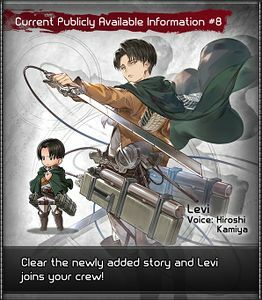 Levi joins you after clearing Chapter 6. Duration: 3 turns on one ally. Large Earth damage to all allies. Plain damage to all allies based on 50% of max HP. Cost to Host: 0 AP Unlock: May appear after hosting Very Hard (Solo or Raid), Extreme (Solo or Raid). Will always appear after completing Maniac. Cost to Host: 0 AP Unlock: Clear Nightmare Lvl 60. May appear after hosting Very Hard (Solo or Raid), Extreme (Solo or Raid). Will always appear after completing Maniac. Cost to Host: 0 AP Unlock: Clear Nightmare Lvl 100 and Ending. May appear after hosting Very Hard (Solo or Raid), Extreme (Solo or Raid). Will always appear after completing Maniac. Party: Guests Levi and Mikasa. 3 3 ? ? ? 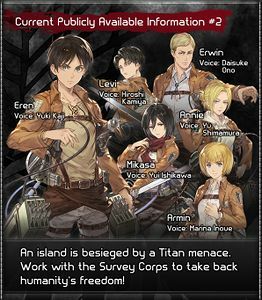 The trailer is narrated by Armin, voiced by Marina Inoue. The trailer BGM is a section of the track, "Attack on Titan", from the Attack on Titan anime's 1st season soundtrack, composed by Hiroyuki Sawano. This page was last modified on 11 December 2018, at 12:45.